What Valve did this year seemed impossible: they improved on the perfection that was the first Portal. That feat was accomplished, surprisingly, by making everything about players' return to Aperture Science less perfect. We got a scuffed-up, messier experience that resonated more deeply than any other game this year. Can Portal 2 open a rift to the top of this year's GOTY contenders? Let's see. Heart-ificial Intelligence: Portal 2 pulled off an amazing role reversal: it made the humans playing it feel like computers and the dueling AIs vying for control feel human. The character arcs traveled by Wheatley and GLaDOS didn't seem robotic at all, and each AI felt, at turns, poignantly insecure and needy. And, at the end of the single-player portion, I felt like a problem-solving machine, electric and sharp, able to coolly think my way out of the game's inscrutable puzzle rooms. Broken Beauty: Portal 2 fractured the clean minimalism of its predecessor and created a different kind of splendor by peeling back Aperture Science's gleaming white layers. Playing through the grimy, rusted-over past of the research firm didn't just introduce cool new mechanics. It showed us the aching soul of a beautiful loser named Cave Johnson, and generated an unexpected empathy for GLaDOS. 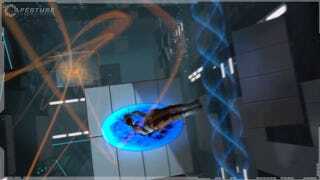 Invisible Woman: I wanted Portal 2 to create more of a connection to the series' mute heroine Chell. It's great that other, newer characters get fleshed-out backstories, but that just makes it harder to care the character I'm controlling when she remains a near-total cipher. Slightly Off-Key: A game's theme song usually doesn't count for much in overall scheme of things. But, c'mon, this is Portal, the series that gave us "Still Alive." After firing that last teleportation blast, I expected a tune that lived up Jonathan Coulton's previous classic. Sadly, "Want You Gone" did nothing for me, even after repeated listens. High-larious - Portal 2 was the funniest game of 2011. The excellent one-off gags, the winning animation work on all of the robots, and Stephen Merchant's show-stealing voice-over performance… I spent 90% of my time with a huge grin plastered on my face. Why can't all games be this funny? I don't know. Writers Erik Wolpaw, Jay Pinkerton and Chet Faliszek, my hat is off to you. Brainy Gamer - Portal 2 was a real brain-tickler. Solving a tricky puzzle before sending yourself careening through the air to the finish line was one of 2011's great gaming pleasures. Musical Heart - The way that Valve integrated Mike Morasky's super-cool music into the gameworld was creative, unexpected, and my favorite addition to the Portal formula. The Ending - Best grand finale of the year, hands down. Thick in the Middle - The single player campaign's middle act felt largely unnecessary. Too many of the puzzles were, basically, "Find the White Wall To Continue." Unnecessary Answers - A pervading sense of ominous mystery was part of what made Portal (and for that matter, Half-Life) so cool. I can't say that the sequel benefitted from adding GLaDOS' and Aperture's backstories. PC Loading Screens - Come on, Valve. Seriously? With Valve terrified of games including the number "3" in them, this is probably the last we'll ever see of Portal. Unless they do a Portal 2.5. Or Portal: The Portal Chronicles: An Origin Story: Chronicles. Good thing it was a great game, then. Funny Bones: Good Lord, this game was funny. Consistently, massively funny. Great writing, top-shelf voice acting. That should be the norm in blockbuster video gaming, but it's not, so Portal 2 gets a big thumbs up for this. Meat On Them Bones: The first Portal was a puzzle game. Room after room of puzzles and little else. Portal 2, with its bottomless chasms and walkways and transitions, felt more like a flowing game, which really helped matters as far as pacing and story-telling were concerned. Too Much: On the one hand, I appreciated the variety of challenges and tools at your disposal in Portal 2. On the other, the game often felt like there was too much going on, and it lost a little of the first game's watertight focus as a result. What have we here? Oh! It's the best game I played in 2011. Playing it - Yeah, yeah, looking at it was lovely. Listening to it was cool. It is a video game, so I am happy to confirm that actually playing Portal 2 was a wonderful experience, too—a delightful experience of thinking, trying, experimenting, leaping, rushing, panicking, hoping and also just having a grand time. Playing it with another person - Of course, the single player of Portal 2 was good. It was an iterative improvement on the ingenious design of Portal the first. Co-op was better. I played it online. I played it on the couch. I played it with a regular friend. I played it with my wife. We were dropping four portals in the labs to solve crazy puzzles, one of which had us taking off from face-to-face ski jumps of sorts, making us smack into each other in mid-air. If another game wins our GOTY vote, I will not be convinced its players had more fun than I had with Portal 2. Nada. It made me laugh too much. This game's a gem. Everything about this game fills me with pure, unabashed joy. Going into these discussions I was 100 percent certain my pick would be Skyrim. Now I only want it gone. Did I Mention Joy? : There hasn't been a moment during my multiple play-throughs of Portal 2 that I've felt anything less than completely pleased with my time investment. From the moment I woke up in the simulated motel room to the final lines of Jonathan Coulton's "Want You Gone" my smile never faltered. Even during the game's most maddeningly frustrating puzzles, I was happy to be challenged by such a well-crafted experience. Sharing is Caring: The addition of cooperative multiplayer in Portal 2 was handled brilliantly. By introducing two new robot test subjects to the mix Valve was able to craft a complex and completely satisfying game mode without compromising the integrity of the single player experience. And this is real co-op, not just two or more players shooting at the same enemies. Whether you're playing with a close friend or a total stranger, by the end of Portal 2's cooperative campaign you're two parts of one well-oiled testing machine. Do I Have to Have a Hated? : I suppose I could be cute here and say I hated that the game had to end, but in truth I felt the game ended exactly when it should have. I've got nothing. There you have 'em, our arguments for and against Portal 2 as Kotaku's 2011 Game of the Year. We'll have one more argument this week, and then we'll vote and announce the winner on Monday, January 2.